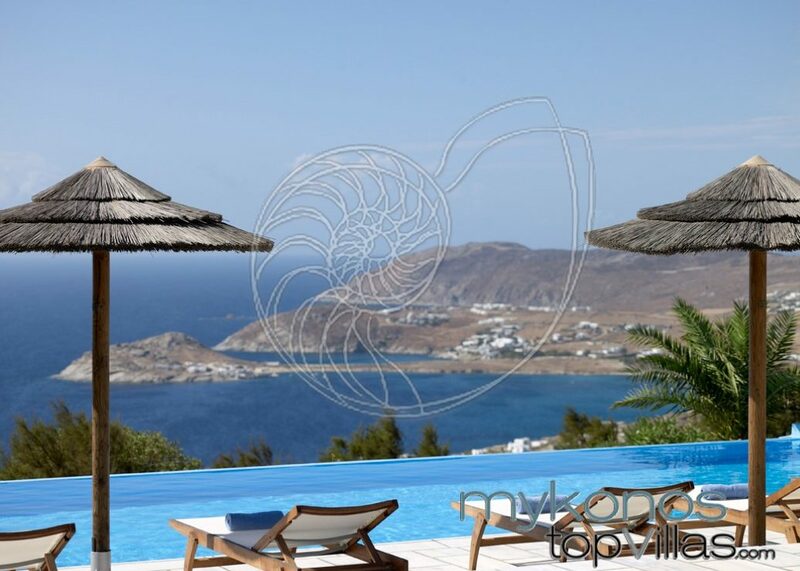 Located hilltop above Lia Beach, Mykonos – a secluded, very large modern villa – offers fantastic sea and country side views with guaranteed tranquility. 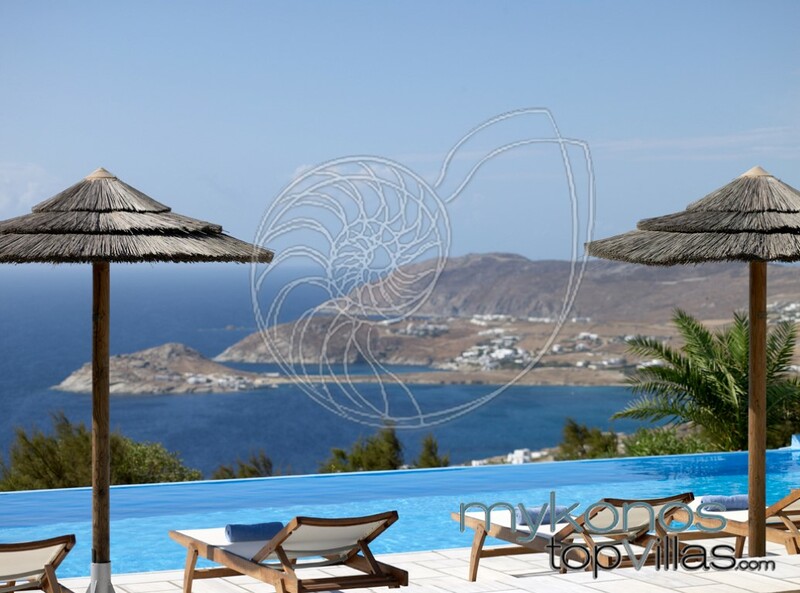 This attractive, brand new contemporary style villa comprises both a main and guest house with separate entrances. Both are similarly styled. Verdant garden, flowers and small palm trees ornate the spacious outdoor areas, which feature a rectangular infinity swimming pool and many terraces. Interiors are bright, white and ultra-sized, with similar minimalist style decor and modern fittings. 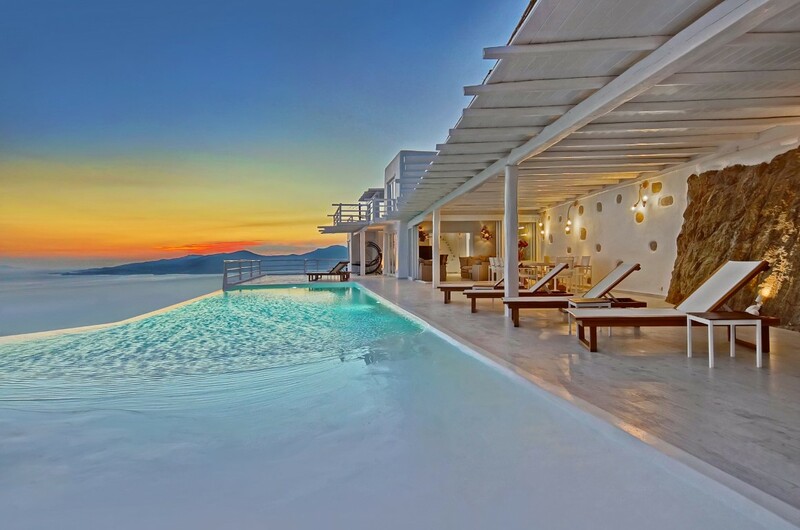 A fully equipped kitchen, accessing a side terrace, communicates with a spacious dining-living room, and also connects with the villa’s front terrace with sea views and swimming pool below. The main house has two bedrooms on ground floor; each with side terrace and three more on upper floor; two have large sea view terrace and balcony, third one has own back patio. 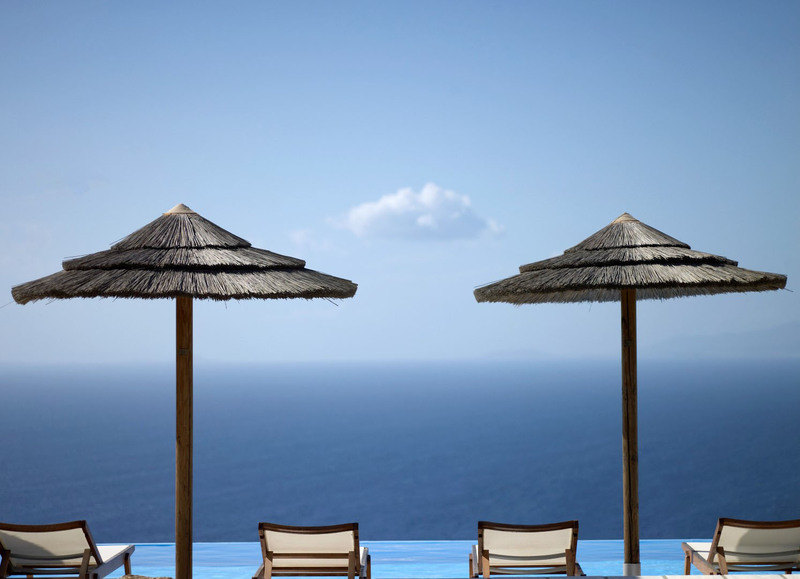 The guest house has one upper level bedroom with sea view patio and two others on lower level; one has pool terrace access, the other has side access to garden and pool. The fully equipped kitchen, living and dining room are open-plan style and all give onto the garden and swimming pool area and a six seats Modern Jacuzzi. The live-in staff quarters have own discreet access to the main and guest house, as well as the laundry room. Villa Harmony is a unique property in terms of size and style, perfect for large families or group of friends, looking for spacious common areas, equivalently comfortable bedrooms and absolute privacy.